An aspiring journalist's story of his aged uncle doctor leads to the uncle's life being profiled on TV. Dr. Sam Abelman: We owe him something, Woody, as rotten as he is. Remember when doctors made house calls and were totally dedicated to their patients? 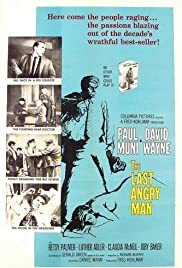 Paul Muni sure was that and a lot more in "The Last Angry Man." Working and living in a depressed neighborhood, Muni was the embodiment of what medicine is supposed to be all about. When he took the Hippocratic Oath, he meant it. Muni as the crusty but beloved doctor turned in a truly memorable performance. He received an Oscar nomination. Too bad it was the same year as Charlton Heston's winning portrayal of Judah Ben-Hur. They sure don't make doctors like that anymore. A definite requirement for new doctors and HMOs to watch. The film is absolutely terrific as it embodies the ideals of what it means to be a dedicated doctor caught up in a world of physicians in it for the precious dollar. Steadfast in his beliefs, Muni gave a brilliant performance. He would never compromise his ideals and would always say that so and so is my patient. Just before his untimely demise, he sees that even a violent criminal may yet have some good left in him. This film is a definite call for the positive in humanity. David Wayne is tremendous as the television producer. He hadn't had such a good part since playing opposite Susan Hayward in 1952's "With A Song in My Heart." As Dr. Vogel, Luther Adler showed what the medical profession has come to, but yet shows what it means to be a doctor when his beloved friend is stricken.